Last Friday I took the long flight from Osaka to San Francisco, arriving Friday morning, six hours before I left. I made it to Mountain View in Silicon Valley in the afternoon to meet with Nancy Duarte, Mark Duarte, and many of the team at Duarte Design, a firm which specializes in presentation design. I gave a short presentation for many on the team and had a small tour of the company. I had to leave early the next day, so I was delighted that I could spend a couple of hours at Duarte before driving up here to Oregon the next day. There are several firms and individual specialists which do presentation design in the United States, but I don't think anyone approaches the quality and expertise of Duarte. These guys are the "purple cow" of presentation design. It's no surprise, then, that their clients include many of the top brands in Silicon Valley. Though I was dead tired from sleep deprivation and jet lag, I had a fabulous time at Duarte Design. I was very impressed. They have a wonderful philosophy and approach, an incredible client list, and a terrific working atmosphere. No wonder they are so creative! 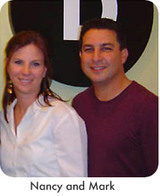 The company has such a positive and relaxed atmosphere. Duarte Design has a real appreciation for the need to appeal to the logical and the emotional aspects of presentations and presentation graphics. From the Duarte website, your can get a good feel for how Nancy and her team "takes an outline or half-baked slides and transforms them into a clear presentation that wins customers for her clients." Checkout these five great articles by Nancy which appeared in Presentations Magazine. Duarte Design delivers great visuals in the end. But in the beginning of the process, they "go analog" and often take the client's ideas and create a sketch of possible visuals. Here you can see a sample concept sketch for an infographics project for Cisco (click "slideshow"). Duarte does a fantastic job of showing its work on its website. Also checkout their work on presentations, motion, infographics, etc. 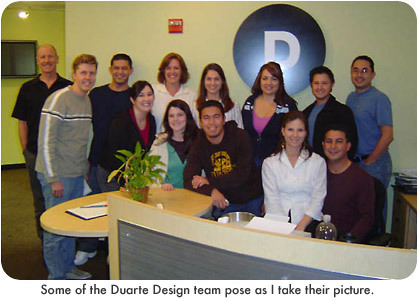 Several of the staff at Duarte are graduates of California State University, Chico. Chico State has a fantastic design program (Department of Communication Design), and in fact Duarte has set up a small office in the town of Chico as well. I'd heard about Chico State's great design department before. In fact, one of my close friends in Japan received her design degree from Chico and has always praised the quality of her experience there. She now is a very successful designer, working with some of the world's top brands in Japan. Chico State is obviously doing something right with their design department. If you're thinking of getting a degree in design, I'd give Chico State a look.